The growing town of Oakville has a thriving population and a wide variety of cultural and seasonal attractions. With an increasing population and varied industry through the city and in nearby Vaughan, residents here often commute for work and entertainment. With driving an important part of life in Oakville, Car Detailing Shop is here to ensure residents can do the best for their vehicles. We offer the best in convenient, affordable car detailing in Oakville with a 100% satisfaction guarantee. To experience the Car Detailing Shop difference and see why we have 100 5-Star reviews from satisfied customers – call the Car Detailing Shop Team at 647-920-5199 today! Car detailing is about more than just making your car look nice, detailing is an effective way to maintain your car and tires. With our complete car detailing, we can find issues in the body of your car, tires and engine before they become major problems. Finding Problems Early: Our tire detailing service can identify loose bolts and compromised tire material before you have a flat on the road. Similarly, our engine detailing can identify loose and damaged parts. Finding these problems early can prevent you from having a serious breakdown later. Prevention Corrosion: In Oakville, we often experience substantial winter conditions which includes ice and salt on the roads. Salt can be particularly damaging to your car’s paint which can lead to rust and other problems. By removing this thoroughly with detailing, you can extend the life of your car. At Car Detailing Shop, we make it easier than ever to fit Oakville car detailing into your schedule with our 100% mobile detailing. 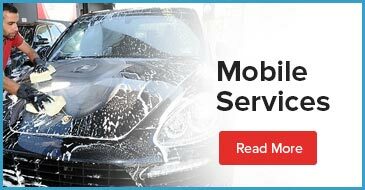 Our fully stocked mobile car detailing units come equipped with all the products and tools needed to detail your car inside and out, including our own water and electricity to ensure we can service your car anywhere you need us! To ensure we’re not just cleaning cars but doing right by our customers and environment, we employ environmentally friendly products and methods in all our services. This includes naturally antimicrobial steam cleaning for interiors. With steam, we get your car’s fabric surfaces clean, germ-free and fresh smelling without the use of chemicals that can pollute water and the air inside your car. Car Detailing Shop is committed to your 100% satisfaction and we back up all our work with a comprehensive guarantee. We pride ourselves on our top reviews from satisfied customers and our hundreds of repeat clients. To learn more about our services and guarantee, call us at 647-920-5199 for fast service and convenient scheduling!